ComEd’s Hourly Pricing program is a great way to save money, not to mention practice wise energy use. One consumer, Jim, recently attended a CUB utility-bill clinic to tell us how Hourly Pricing has saved him hundreds of dollars! Hourly Pricing allows customers to pay the hourly market rate for electricity, instead of the standard fixed supply rate most customers pay. While electricity prices can spike during certain periods, such as blazing hot summer afternoons, most of the time market prices are lower than the utility’s fixed rate. Customers save by adjusting their electricity usage to when prices are lower. Jim has been on the program for nearly a decade. “Part of the reason I signed up was because I knew I could shift my usage hours,” he said. 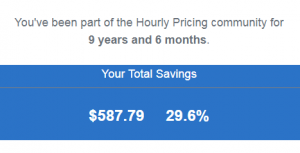 To be exact, over the years Jim has saved $587.79 on Hourly Pricing–that’s 29.6 percent savings. Overall, Hourly Pricing customers are saving an average of 15 percent on the supply portion of their power bills. Programs like Hourly Pricing help reduce electricity demand at “peak times.” Reduced peak demand eases stress on the grid, helping to prevent costly power outages. Lowering peak demand also reduces the need to fire up more expensive “peaker” power plants. The less consumers have to rely on “peaker” plants to meet electricity demand, the lower electricity rates can be for everyone. To see if Hourly Pricing may be a good fit for your household, check out CUB’s Hourly Pricing fact sheet. For Ameren customers, there’s a similar program called Power Smart Pricing. At events across the state, a CUB expert can help you enroll in various money-saving programs through your utility. Visit our events calendar to see when we’ll be in your neighborhood.